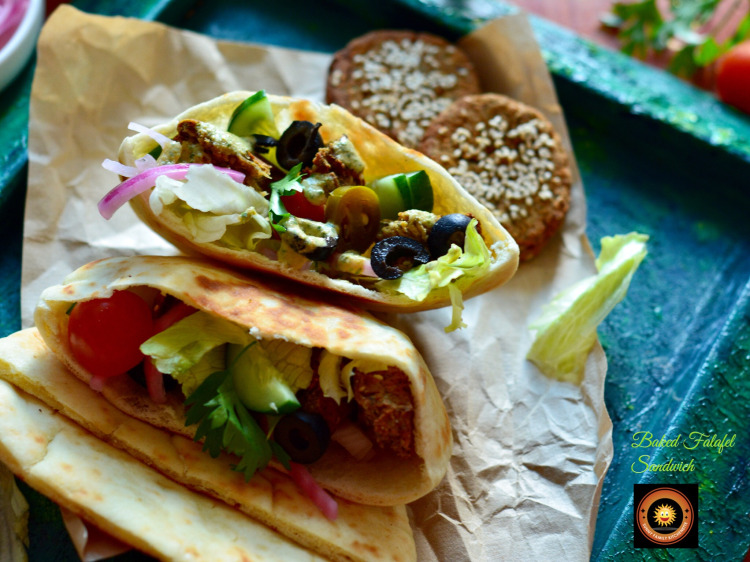 A popular Middle Eastern combo, this Falafel sandwich combines the healthy and hearty chickpea patties with pita bread. 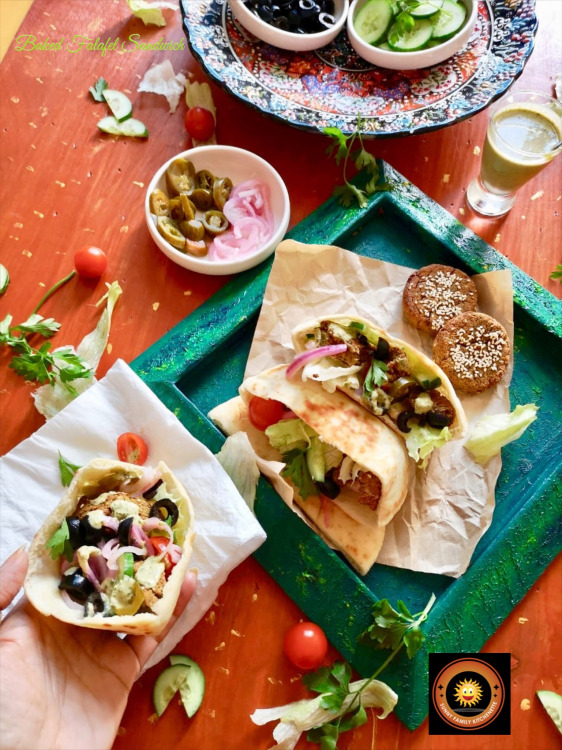 Hot, crunchy and succulent Falafels filled in Pillowy soft Pita bread along with goodness of salad and drizzled with Nutty and lemony Tahini Sauce- what else one can look for in comforting soulful food? Is it a sandwich, snack or a complete meal in itself? Well, if you ask me this is more than a complete meal wrapped in one good roll. Proteins, Carbs, Fats, Vitamins, Nutrients, Roughage- All the essential elements of one complete meal are taken care of in this one Sandwich. Carbs in the form of the Pita Bread. 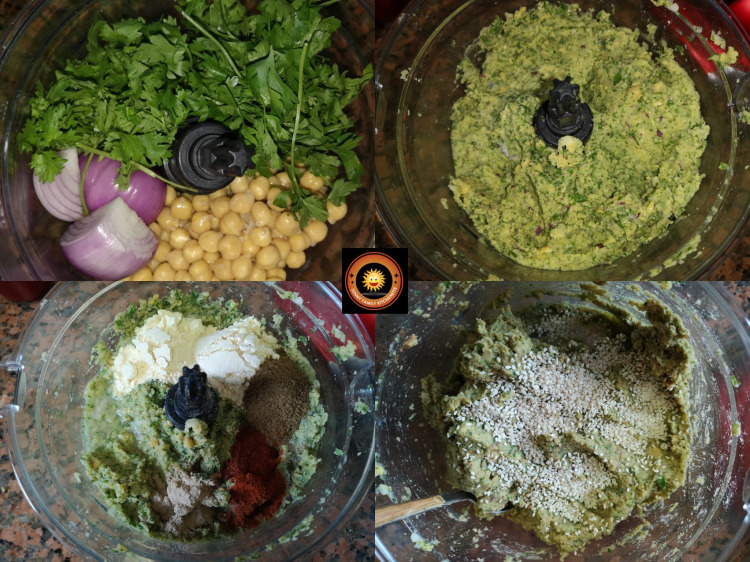 Proteins in the Chickpeas loaded Falafels. Essential oils and Calcium-loaded Sesame seeds are also there. Lettuce, tomatoes, onions and all provide good roughage. Traditionally the Falafel Patties are deep fried but I have baked them to bring in the healthy element!! That sounds cool and makes this yummy treat absolutely healthy and guilt free!! We will start by by adding the chickpeas to a food processor and pulse until chunky. Add in the coriander, parsley, onion, cumin powder, garlic powder, lemon juice, flour and paprika powder. Pulse until all the ingredients are minced well. Do not pulse too much as we want a crumbly, chunky mixture (don’t over-process, you want to obtain texture, not a paste). Take about 2- 2.5 tablespoon of falafel mixture and shape it into about 2 inch circular patty. Similarly make all the patties. Place all the patties on the baking tray and keep the tray in fridge for about half an hour. Brush the top of the falafel with oil prior to baking. Set oven on preheat mode. After half an hour, take out the tray from the fridge and keep in the oven for 15-20 minutes at 180*C.
The falafels will turn to golden brown color. Falafels are ready to be served. 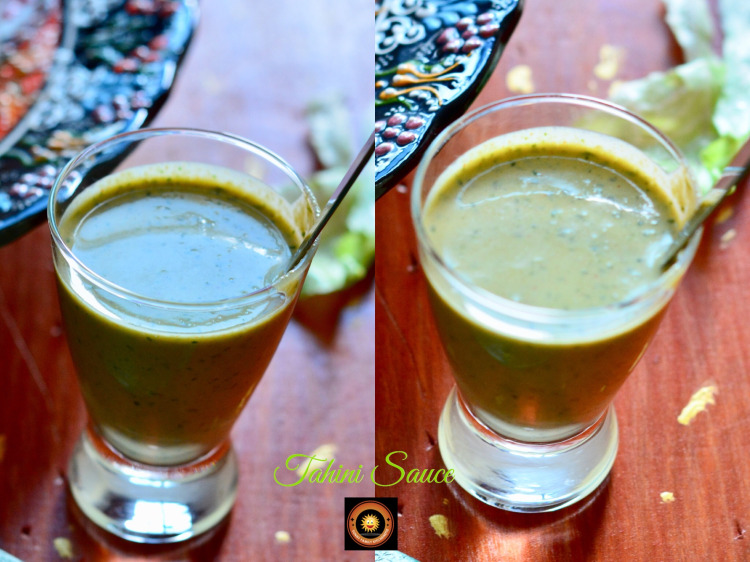 Grind together everything listed under the Ingredients of Tahini Sauce. Check and adjust seasonings according to your taste. Now, all the ingredients are ready. We will Assemble the sandwich now. Heat a frying pan or griddle to medium high heat. Spray or brush with little amount of cooking oil. Heat the pita rounds for 2 minutes on each side. The pita may begin to brown a little. Cut each pita in half, open the cut end forming a pocket. 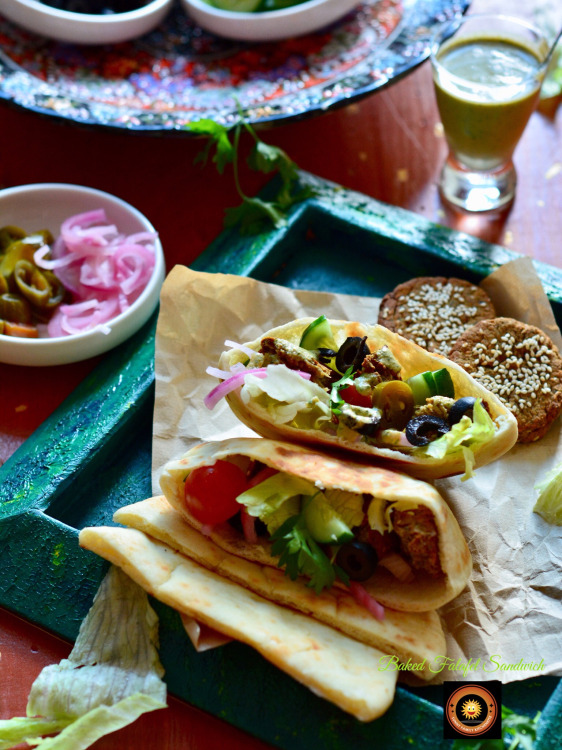 Stuff each pita half with the Falafels, lettuce, sliced tomatoes, sliced cucumber, sliced onion, olives and jalapeños. Drizzle with the tahini sauce. When I first saw the photo of this delicious looking, so different and tempting sandwich on FB, I couldn't stop starring at the photo. Falafel sandwiches will definitely feature soon on my dining table. Looks very filling too. 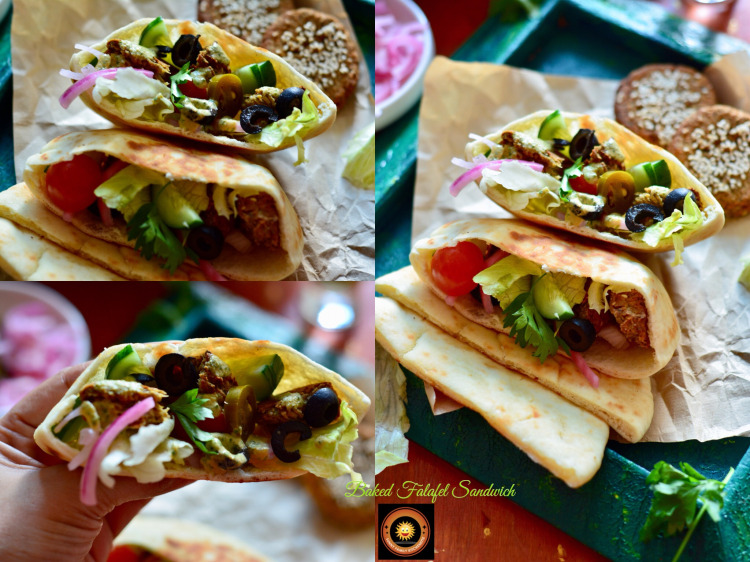 The pita pockets look so yumm with falafel filling. Lovely share for the theme. The pita pockets with all the perfect elements look amazing. I am sure they taste amazing too. This is my go-to dish to order at any Mediterranean restaurant! Love it; you have made it easy to make these at home with your easy and beautiful recipe! Awesome dear! 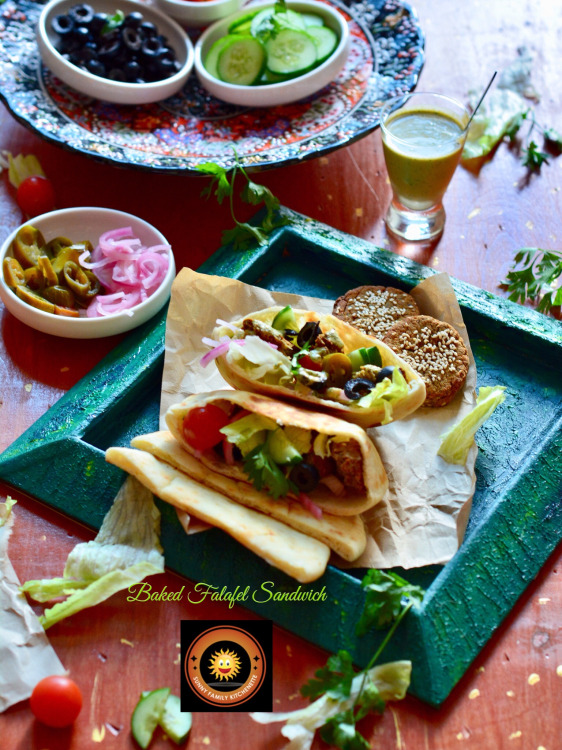 I love falafel, and to use them in a sandwich means to make them all the more delectable. Beautiful recipe, and lovely pics!